Just a note that this entry is participating in the Morsels & Musings Festive Food Fair. If you were following from the main blog, we were in Cheonan, South Korea, at SunMoon University (owned by the Moonies) for a KOTESOL (Korean Teachers of English to Speakers of Other Languages) conference. 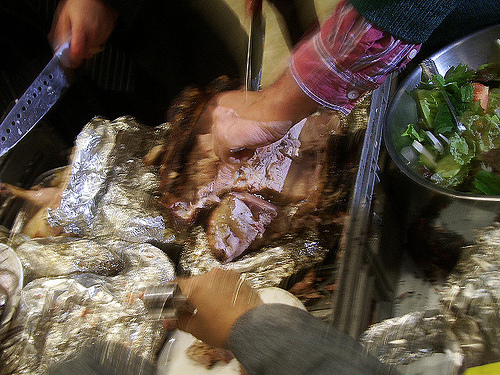 The big event was the New Zealand Māori hangi style barbecue Thanksgiving dinner. 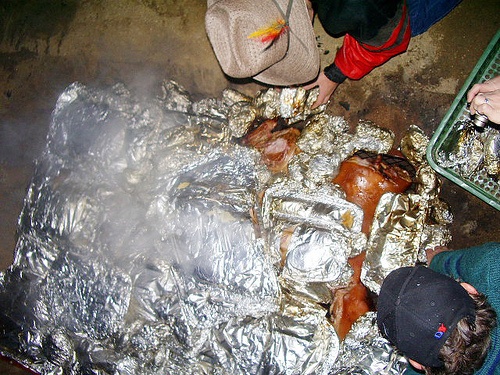 It’s also called umu in Hawaii and other countries of the Pacific. Okay, so this is how it’s done. You could say it’s the recipe. Dig a pit in the ground. It doesn’t have to be big. It just has to be big enough for the food and stones that come later. 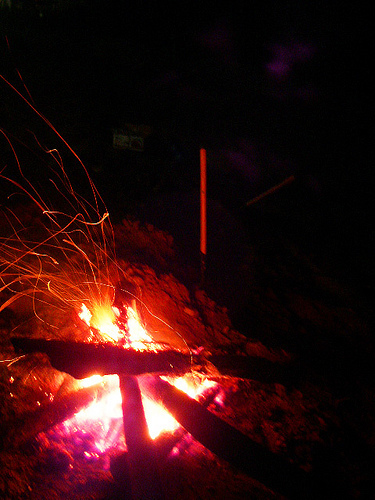 Heat rocks (preferably igneous rocks, like lava rocks) over a fire until they’re white hot. Line the pit with the rocks. 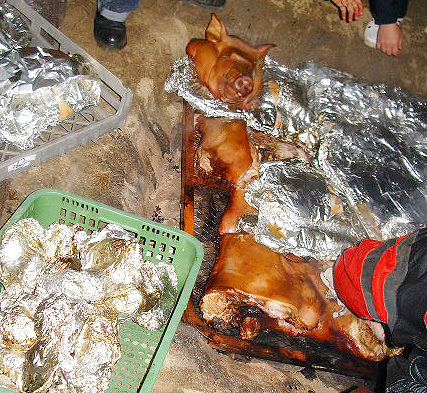 Place the food, wrapped in foil, in the pit. 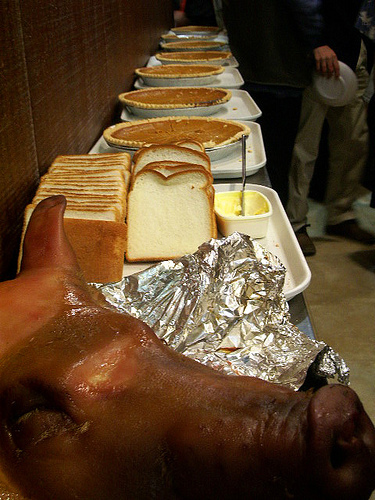 In this case, we had sweet potatoes, chickens, a whole cut up pig, and a few turkeys. 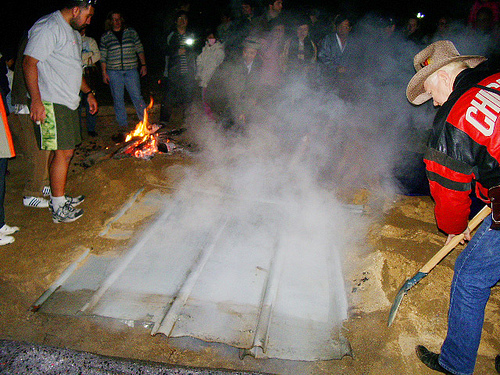 Cover the pit with something like metal sheeting. Then cover with dirt. Cook for two to three hours. I arrived during the cooking part. You see, we were busy much of the day, and I missed the start of the cooking. I wish I was there. The guy in charge of this was from the Cook Islands himself. He got stuck in traffic, though. So dinner got off to a late start. 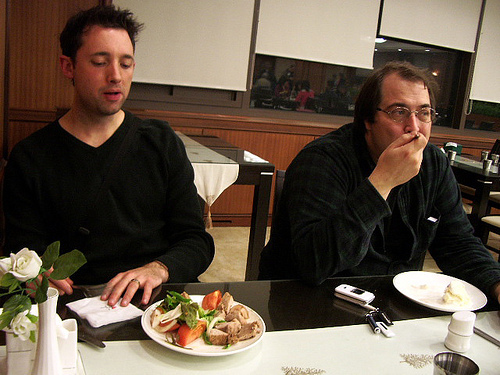 When the conference was over, Aaron was worried because the food was far from ready. The attendees entered the cafeteria in the imposing “Main Building” on campus. There wasn’t much Aaron could do. He handled it as best he could, though. He announced that dinner was running late and would be ready — um, in an hour. People groaned. Check out the lady in the foreground. Aaron offered to refund the meal tickets. A few took him on the offer but not many. One of the attendees volunteered to entertain everyone with his saxophone. I wanted to go down and see the cooking. I found it in the back of the building on a plot of land that looked like it was used for farming. A small group had gathered, enjoying the fire and breaking the university’s dry campus policy. The food was buried in front of the fire in the picture. People didn’t know and kept walking on it. This was another example of how glitches become blessings. The original idea was to have the food waiting for us in the cafeteria. 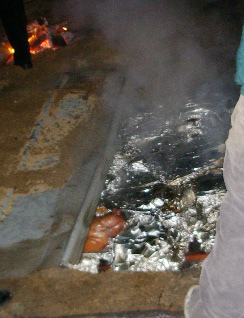 The delay caused everyone to come outside and enjoy the atmosphere of cooking food in a pit. It was fun, but we were also HUNGRY. All we had to eat all day was snacks from the inconveniently located convenience store. 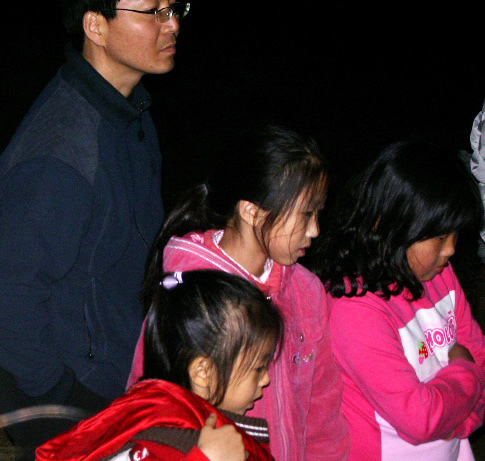 One of the Korean organizers said that we should just go ahead and dig up the food. Break out the shovels, everyone! Chris (left) helped with the digging. As did I. 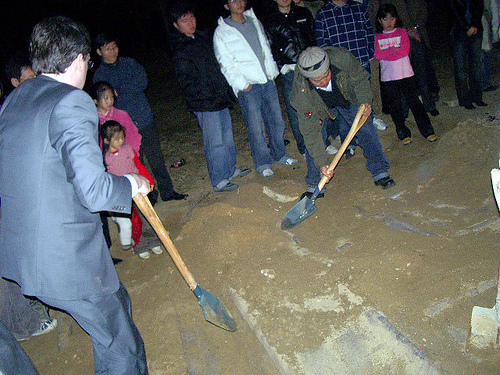 With all these guys in suits digging, it looked like a late night groundbreaking ceremony for a shopping mall. I started smelling roasted meat. It smelled good. Then we got steam! The cook is the guy in shorts on the left. Everyone watched in anticipation the unveiling of the food. Oh yeah, can you smell it? There are some pictures that you can even smell on a computer screen. Piggy looked like he’d seen better days. The sight made me want to look for someone with a conch shell. The meat was loaded on plastic dishwasher trays, I assume, and carried into the building and up the elevator to the fifth floor cafeteria. I went to go get a new supply of batteries for the camera from the car. When I returned, there was a horde with plates, grasping for meat. Despite getting fresh batteries for the camera, my pictures didn’t turn out as well as I hoped. It’s a food blog entry with bad blurry close ups of the food, such as this one. 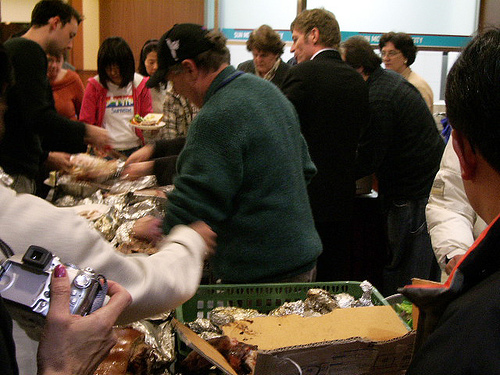 Keep in mind, I was being jostled by a lot of English teachers who hadn’t tasted turkey in YEARS. 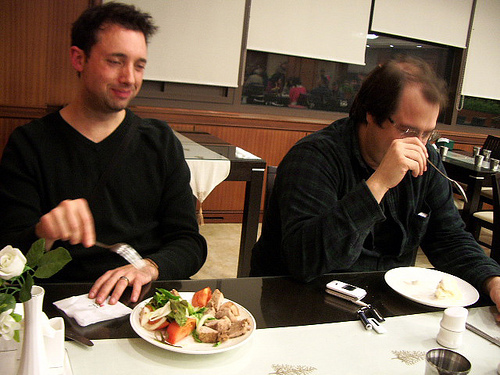 And I was being pushed aside by Koreans who wanted to find what this big hoopla about turkey was about. I did get some decent shots of salad. 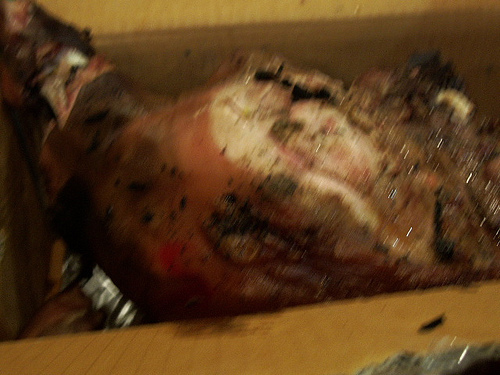 And a pig head with pies. The pies were from Costco and was another treat in a country where most Westerners don’t have ovens in their homes. 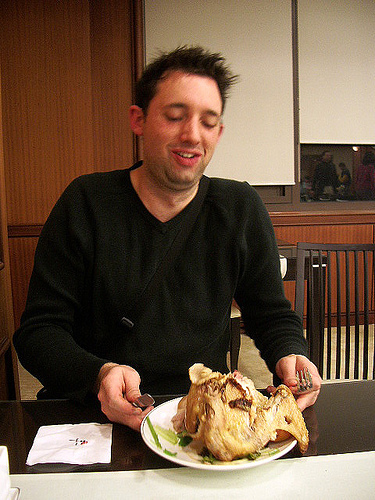 Poor Ben had just gotten his plate filled and was about to head to a table when he was recruited for turkey carving. I’ve never seen such anger repression in Ben. He did finally get to eat. 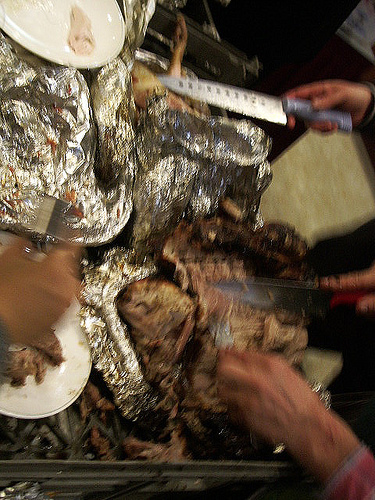 In fact, since some people left and there was so much meat, they were forcing it on us. And let me tell you this. My first hÄngi food experience was amazing. This created the smoky barbecue flavor while retaining a lot of moisture in the meat. The chicken breast was not dry. 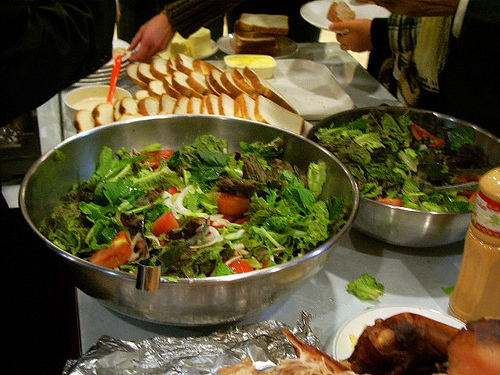 Granted, a few things were undercooked because we were short on time. They had to steam one of the turkeys in the kitchen to get it to cook all the way through. I didn’t have any turkey. The pork blew it away, in my opinion. I went up to the carver with my plate, and I saw him peeling some crispy fatty skin off the meat. 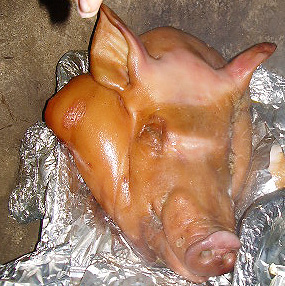 I didn’t gross anyone out by snagging myself a foot or carving a cheek off the pig’s face. 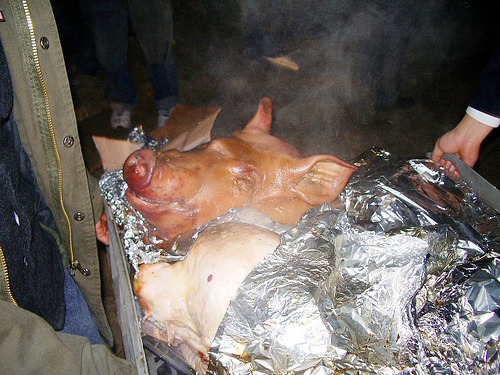 It was the most amazing pork I had ever tasted. I’m pretty sure of it. Ben and the Chrisses agreed. It was pure aromatic earthiness. The smell of the pig and the oven stayed with me the rest of the evening. It’s been over twenty-four hours, and the taste is still lingering in my mouth. I want more. I’m definitely going to more of the conferences.